The food writer will give a reading at the Mercantile Library on June 9. Luke Barr is the author of Provence, 1970, an intimate peek at a turning point in America’s culinary history when six iconic figures, including James Beard, Julia Child, Richard Olney, and his own great aunt, beloved food writer MFK Fisher, found themselves together in the south of France. Barr recounts—with wry humor and an eagle eye for detail—the eating, drinking, and laughing (not to mention smoking and bickering) that went on late into the winter nights. Dining editor Joanne Drilling caught up with Barr by telephone in anticipation of his reading at the Mercantile Library on June 9. JD: You’ve written several feature pieces about traveling to and cooking in Provence while you were a features editor at Travel + Leisure magazine. How did that translate to Provence, 1970? LB: I was a features editor and wrote for the magazine, infrequently and rather self-interestedly. In this case, I assigned myself a story about Aix-en-Provence and travelling in my great aunt’s footsteps. She had written quite a bit about southern France and I grew up hearing about the trips that my dad and his brothers made with their aunt to France and Switzerland. While there, I traveled to La Pitchoune, the vacation house that Paul and Julia Child built in the mid 60’s. 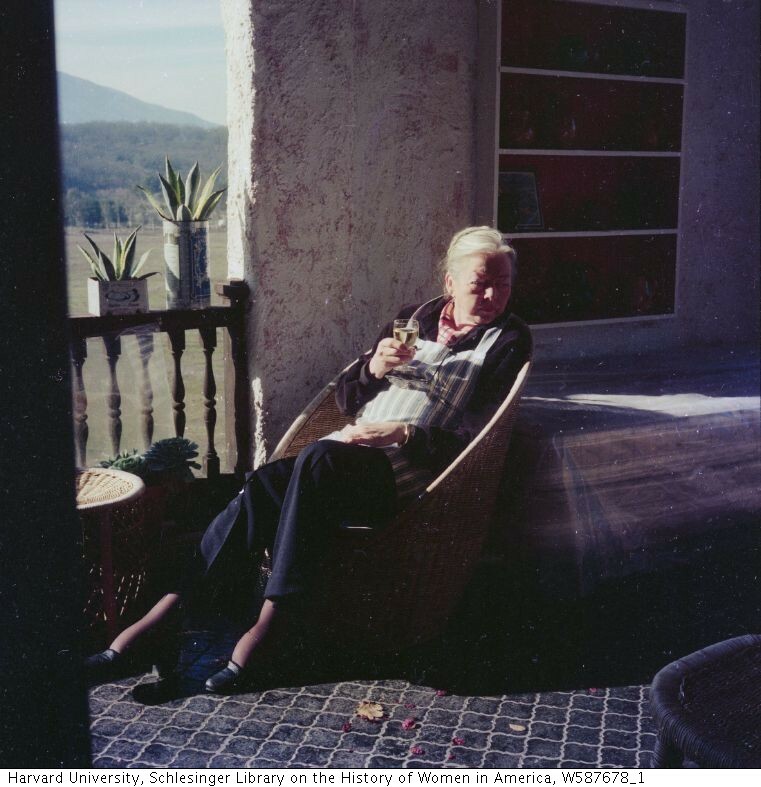 That was my first visit there and I discovered by accident that in 1970, all these people were in Provence at the same time: Julia Child, James Beard, MFK Fisher, Judith Jones (Child’s editor at Knopf), Richard Olney…. I mentioned this in passing in the article and my agent called and said, “Luke, this paragraph could be a book. Let’s do it!” At that point, I started researching more deeply into that moment (1970) and it turned into this book. Paul Child took this photograph of M.F.K. Fisher at Last House in the late 1970s. Photograph courtesy Schlesinger Library, Radcliffe Institute, Harvard University. JD: I love the jacket of the hardback copy of your book. It looks like a weathered, vintage notebook and is marked, simply “Provence, 1970” as if it were a humble journal. I have to know, was there actually a notebook? LB: Yes! There was indeed a notebook. I went out to California to see my cousin Kennedy, MF’s daughter, who keeps a sort of storage locker with all kinds of stuff in it. Since I was writing about a really specific time (November and December, 1970) I was able to go quickly through all the boxes. Then low and behold, I found that blue spiral diary. Right after hanging out with the Childs, Beard, etc., MF had decided that she needed to get some writing done and went off by herself and checked into these old hotels in Arles and Avignon over the Christmas period. That’s where she wrote this diary. Finding the diary was a real stroke of luck for me because I had access to her interior perspective. JD: Were there any other pivotal research moments? LB: What’s funny is that I sold this book based on an idea but I hadn’t done any real research. I had yet to go up to the Schlesinger Library at Harvard where Julia Child’s papers and my great-aunt’s stuff are housed. I was extremely fortunate in two ways: The first being that they were all truly wonderful letter writers. It’s a lost art. I don’t just mean MFK Fisher but also Julia Child, Paul Child, James Beard, Richard Olney—they all wrote wonderful letters. I had this day-by-day, account of what had happened in a very brief time period which was great because I was trying to create what I hope is a detailed, almost novelistic recreation of this period. In order to do that, I needed granular details. If you read MFK Fisher, she writes like a New Yorker writer of that era. It’s very elegant and posh. It doesn’t feel nearly as modern and fresh as her letter writing. Her voice in her letters is ironical and funny with lots of gossip. JD: Let’s talk letters. When you visit an archive library, you don’t exactly just check out historical papers and letters and take them home with you. Can you speak to the process of working with those materials? LB: It was fascinating. In the case of the Schlesinger, they’ve got boxes and boxes of both Julia Child and MFK Fisher stuff. It’s all catalogued with a great level of detail. You request a few folders at a time and you have to sit in the library. I transcribed a lot and took notes. It was also easy to take iphone snapshots. It’s funny, the Julia Child and MFK Fisher stuff was incredibly well organized but I was always trying to track down the James Beard material. You’d think that the James Beard correspondence, which was voluminous, would be at the James Beard Foundation. But it’s not. He grew up in Oregon and decided to give his entire papers to a university out west that had approached him. He donated them, but then the library didn’t catalog the papers, because it was a huge amount of work and expense. The papers just sat in boxes for years. Eventually, NYU convinced this other university to ship them to NYU. At this point, when I was working on the book, I knew the documents were in New York but had yet to be catalogued. I finagled my way into the NYU library, and went into the back area where they were storing the boxes. I literally found a wine glass in one. I was digging around but I knew exactly what I was looking for—a correspondence between him and MF or him and Julia from the early 70s. I also found some really great letters from Richard Olney to James Beard in those boxes. It was very much a case of being a detective. JD: I heard that you’ve been working on a book about Cesar Ritz. How’s that going? LB: I’ve written it and now I’ve gotten the notes back from my editor to revise and flesh things out. I’m trying to do that as quickly as I can. It’s funny, you develop a momentum with a book and then there’s a panic to just finish it, followed by this huge sense of relief. I have to kind of gin up that panic again so that I can get back to it. I’m not done yet, but this is the easy part. JD: Is it just a straight biography? In 1889, Richard D’Oyly Carte, who owned the Savoy Theater, was opening a luxury hotel in London called the Savoy. He wanted to do a truly modern hotel and he got Ritz and Escoffier to come over and open it. Soon enough they were engulfed in scandal and got kicked out. So they went to Paris and opened the Paris Ritz. There’s a lot of incident and drama but fundamentally it’s about how the 1890’s was such a fascinating and changing period. For example, at the Savoy restaurant you would have aristocrats and bohemian artist types like Oscar Wilde and you would have these wealthy Americans and nouveau riche industrialists all mingling together in the same place. The reason I knew it could work is that you realize very quickly that even though it seems like ancient history, it’s basically modern. They are modern people with modern psychological issues. Historical figures can seem dusty but these felt very alive. But it was a totally different research project from my previous book. On the flipside, in Provence, nothing really happened. That was the conundrum of the Provence book as a writer. Here’s great characters, an amazing setting, a historical moment, but there’s not a lot of action. I had to make the drama out of what I could find. Whereas in this book I’m working on now, there’s tons of action, there’s lawsuits, scandals, cover-ups, all kinds of good stuff. To purchase tickets to Luke Barr’s June 9th reading at the Mercantile Library, click here. To participate in the June 1st Mercantile lunchtime discussion of Provence, 1970, led by dining editor Joanne Drilling, click here.